Photo GeoTag allows you to geotag JPEG and TIFF files, or change the existing geotag information. 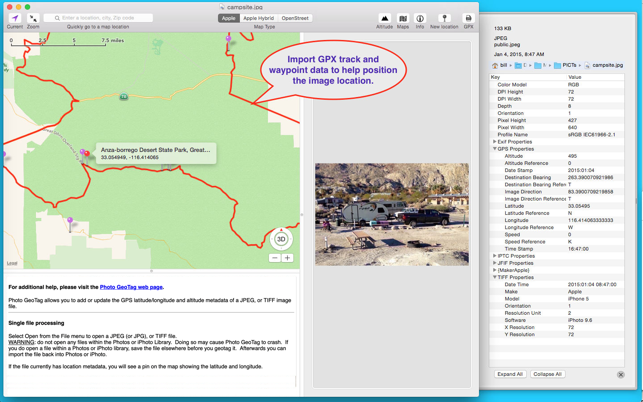 It’s a great way to add or correct the GPS properties of any JPEG or TIFF file! Have a lot of photos with no GPS values? Now you can easily geotag them. Have photos with an incorrect GPS location? Now you can easily correct the GPS location. When you open a JPEG, TIF or TIFF image file with Photo GeoTag, the image and a map are displayed on a single window. If the image has GPS properties, a map pin is placed on the map representing the GPS location. To change the latitude and longitude GPS properties, simply drag the map pin to a new location. To add the latitude and longitude GPS properties, either specify the address, or the latitude and longitude values, or simply shift-click the map and a pin is dropped on the location you clicked. It’s that easy! To update the altitude, click the altitude button. No changes are made to the file until you save your changes. A batch mode is also available for assigning the same location to multiple files. - Change the existing latitude and longitude location of a JPEG or TIFF geotagged file. - Add latitude and longitude location values to a JPEG or TIFF file that has not been geotagged. - Add or update the altitude to a geotagged JPEG or TIFF file. - Import GPX track and waypoint data for reference only (to automatically set the photo location according to timestamps from GPX data see our app “GPX Photo Geotagger”). - Inspector drawer shows image metadata. - Send the location to Apple Maps. - Choose OpenStreetMap as the map source. - Image is no longer recompressed. - Batch mode for processing multiple files at once. - Show satellite view of location. - Edit or add photo creation date. - Export screenshot of map. You cannot edit photos directly within the Photos library (this is also true with other apps such as Preview). You must export the photos, geotag them, and then import them back into Photos. Added "Copy map image" to the Edit menu. Added Google map tiles to the map menu. Die App ist etwas umständlich, aber wenn man das Prinzip erkannt hat funktioniert sie gut. Konnte die ersten Fotos gut mit den Trackdaten verbinden. Die Anzeige der Standorte stimmte überein mit dem tatsächlichen Standorten. 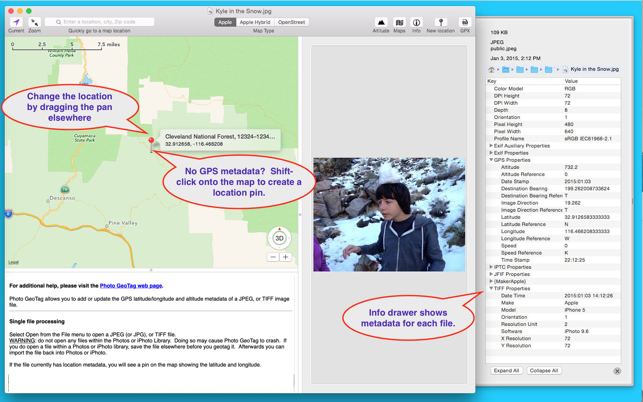 You can set any location for a single picture, or any location for a group of pictures when in batch mode. I'm not sure what else you expected. Ich wollte das Tool einsetzen, um ein paar hundert Fotos anhand eines GPX-Tracks zu taggen. Die Aussage „Import GPX Track…“ hat ich vermuten lassen, dass dies möglich ist. Leider wird der GPX-Track allerdings nur in der Karte zur Orientierung angezeigt - es gibt keine Möglichkeit, den Fotos die Koordinaten automatisch anhand von Zeitstempeln zuzuordnen. Man muss die Fotos trotz vorhandenen GPX-Track manuell auf der Karte verschieben. Um einzelne Fotos nachträglich zu tagged sicherlich ok - für mich ein Fehlkauf.